One of the big to do projects on our list is to replace the flooring in our home. We also have a lot of little feet running around our house all of the time, so that is a big determining factor when we decide what type of flooring to purchase. Chris Long from Home Depot has a few tips on picking out the best flooring option for kids! If you have children, your priority checklist for flooring options necessarily changes. Not only are you looking for something attractive, but you'll need a softer place for those inevitable falls. You'll also want to find a flooring option that is durable and easy to maintain, given the likelihood of occasional scuffs and scratches from having kids shuffle through the house with LEGOS and Big Wheels in tow. The good news is that it's possible find a practical, safe, and attractive flooring option that keeps your kids comfortable while also expressing your personal style. Here are some considerations about the durability and safety of several popular flooring choices. Hardwood flooring is always a classic and elegant choice. But is it safe for children? How can scratches and dents be avoided? Fear not: if you're leaning toward hardwood flooring, it is possible to keep your little ones cushioned from the occasional fall. Consider adding area rugs for extra warmth, comfort, and padding (not to mention style). Be sure to get rug pads that are safe for hardwood floors (felt and rubber are good options) to create a slip-free zone for the whole family. If you have small children, you can use kids' mats over the hardwood floors to create a shock absorbent flooring option. Made of EVA foam, kids' mats are non-toxic, portable, and easy to clean; they come in interlocking tiles and in a range of colors. Carpeting can be a warm, inviting and cozy option; it also helps retain heating and buffers sound. If your kids are prone to allergies, you might think twice about carpet, but carpeting made of hypoallergenic materials is, in fact, an allergy and asthma-safe option. Removing shoes at the door along with vacuuming two to three times a week will help remove dust and allergens and extend the life of the carpeting. Invest in a carpet pad to enhance the comfort and life of the carpet. Durable, easy to clean, and available in attractive colors and designs, ceramic tiles may be a good choice for the kitchen or the bathroom. Tile can crack and be slippery when wet, so choose tiles with textured surfaces. If maintained according to the manufacturer's recommendations, tile can be quite durable. Be sure to clean regularly, as tile can get dusty and hold allergens. If you're concerned about your children slipping, you can always add area rugs to the kitchen to soften those bumpy landings. Vinyl may seem to be an attractive option, since it's inexpensive, slip resistant, and easy to maintain and clean. 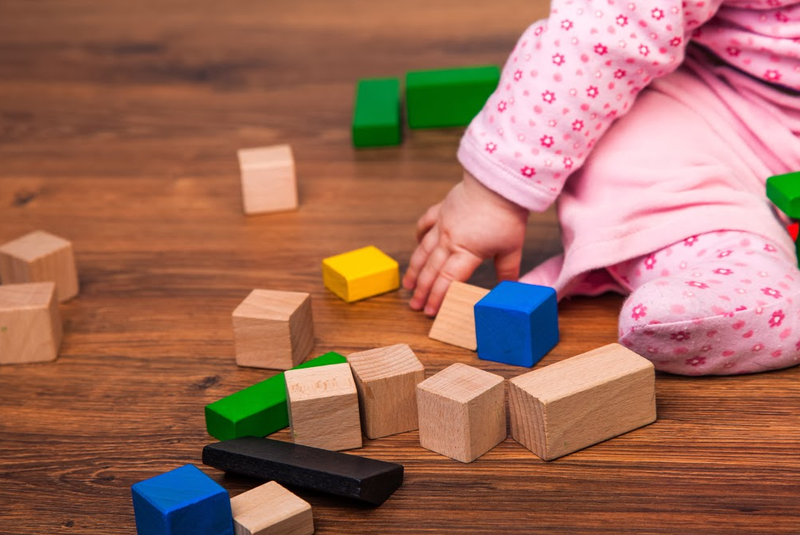 But buyer beware: numerous government agencies have published concerns about the chemicals that may be used in manufacturing vinyl flooring affecting the health of small children. The flooring industry does have a FloorScore certification which indicates low VOC emissions for their products, a good thing. Many products, such as TrafficMaster Allure, carry this specification. . The stakes can be high when deciding which flooring option to go with, so do your research and consider the pros and cons of each possibility. On the plus side, laminate flooring is affordable, easy to clean, and damaged planks can be replaced fairly inexpensively. Easier to install and maintain than hardwood flooring, it's a less expensive option that can simulate the look of natural hardwood. But laminate may be less durable than other choices, particularly in high-traffic areas. Some brands are equipped with water-resistant coating, but spills should be wiped up right away, since water can cause laminate to swell and warp. While laminate is naturally resistant to the growth of mold and bacteria, be aware that some laminate flooring may contain formaldehyde, which can affect the indoor air quality. Once again, look for industry standard certifications on the flooring you are considering. The GREENGUARD certification insures lower total VOC emissions. An environmentally friendly, stylish, and increasingly popular option, bamboo flooring offers many advantages. Ecologically speaking, bamboo is nontoxic, biodegradable and easy to recycle, and on a practical level, bamboo flooring is a breeze to install, and so durable that it can last for decades. It's also surprisingly easy to clean and doesn't require harsh chemical cleansers; periodic vacuuming and mopping with warm water can do the trick. Bamboo can be prone to showing scratches, so that's something to consider if you're re-flooring a room that receives a lot of foot traffic. You may be surprised to learn that cork flooring is rising in popularity, but it can be an attractive, comfortable, and safe option to consider. Another nontoxic option made of natural materials, cork is soft for children's feet and offers as much variety of attractive colors and patterns as other flooring options. While it may not be the most durable option, it doesn't have to be expensive to repair since it's available in interlocking planks. What kind of activities will your kids be doing in each room? How easy to clean and sanitary is the flooring? How much moisture will the flooring be exposed to? How easy to maintain is the flooring? How long do you expect it to last? Are there health or safety concerns about this flooring option? Could area rugs enhance the flooring? Do you have concerns about your children's comfort and safety, or about the durability of your flooring choice? Have you asked experts for help as you've shopped around? Chris Long has been a store associate at a Home Depot in Illinois since 2000. Chris is a frequent contributor on flooring DIY topics for Home Depot's website. The content from this post was provided by Chris Long from Home Depot. No compensation was received in exchange for publishing this content.